Most parents have been through it and there really is a learning curve on how much or how little to pack when taking kids on a vacation. With the stringent airline luggage rules, you don’t want to be paying for over weight luggage but you also don’t want to have to be concerned about finding a place to do laundry while you are away. While some resorts may have self serve laundry facilities, many don’t and to have clothing laundered at your resort or on your cruise ship can cost a fortune. Put all of your travel documents, vouchers and passports and put them together. Just because it’s really easy, I put them in a gallon size zipper bag. It’s light weight and doesn’t add extra weight to my purse or carry on. Pack a complete change of clothes for each family member in your carry on. This comes in handy with food and drink messes as well as the dreaded times when luggage may be delayed. Another HUGE tip, split each family member’s clothing into different suitcases so, for instance. Don’t put all of your clothes in one suitcase if you have multiple suitcases. If one bag is lost, you’ll have a few things to wear until your bag is found. If you are traveling with a baby, bring extra diapers and wipes and call ahead to see if you can purchase diapers and baby food at your resort. There are some family friendly all inclusive resorts that have baby food in the restaurants or in the gift shops. My Vacation Lady’s family vacation specialists can guide you to some of those, if you would like that convenience. Pack plenty of snacks for the flight. String cheese, fruit, finger food are all good choices. Skip the yogurt or juice boxes since they will not be able to go through security. Pack plenty of toys and activities for the flight. Coloring books may not be high tech but may keep the kids busy for a while. Pack crayons or markers and pipe cleaners in zipper bags to keep them occupied. Remember that Ziploc bags are your friends! Pack a backpack or rolling carry on bag for each child and have them “help” you pack it with things to keep them busy on the flight and make each child responsible for their own bag. Down load a lot of movies on your tablet and bring head phones so the kids won’t disturb other passengers while watching Frozen for the 99th time. Reward good behavior with “travel certificates” which can be traded in for a special souvenir or to be able to pick out a special fun activity to do. Pack a bathing suit in your carry on it you are heading to a beach resort or a cruise. 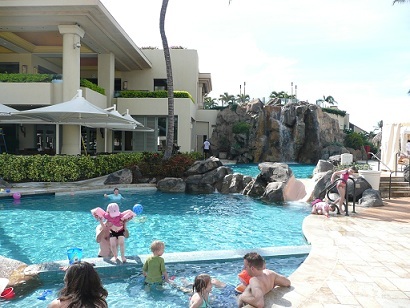 After travel, let the kids go for a swim and burn off some energy. Remember that family vacations make life long memories. My kids who are now adults still bring up things that we did on family vacations when they were growing up. Help your kids collect memories– not things! My Vacation Lady can help make your next family vacation easy and stress free.